From muslin swaddling cloths to sleeping bags to cot sheets, Aden + Anais' range of baby goods are based on the family traditions that founder Raegan Moya-Jones brought with her from Australia to the US. Aden + Anais focus on products developed for your baby, but designed for you. And few other of their pieces project this idea more so than the Serenity Star. This beautiful little star is so many things wrapped up in to one. It’s a clock, a night light, a room temperature indicator, a sound machine, and a feeding diary. 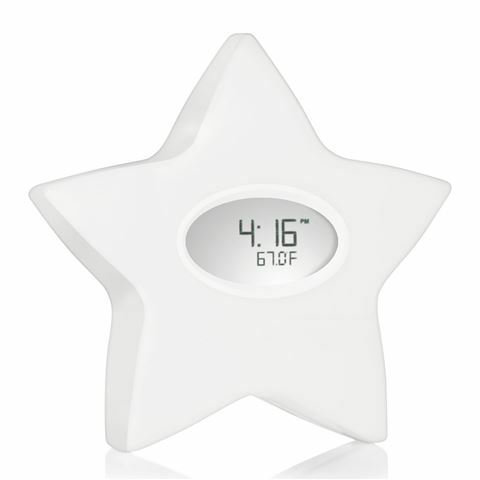 When parents are forced to multi-task these days, the Serenity Star provides indicators as to when baby last started feeding, and if you are nursing, even recalls the side you last fed from. Technology and Aden + Anais style come together to create a glowing room temperature indicator: the Serenity Star will glow white when the room temperature is optimal, or blue if the room is too cold. Red, and the room is too hot. It can also play soothing sounds to help your baby sleep, including two lullabies, white noise, or a heartbeat. All stars twinkle and sooth – but only this one creates serenity for you and your baby. Sturdy plastic casing with blue backlit-screen. An electronic feeding and sleep system for babies. Operates as a feeding diary – record the last time you started feeding, and if nursing, record which side you last fed from. Operates as a sound machine – plays four calming sounds: two lullabies, white noise, and a heartbeat, with play times of 30 minutes, 60 minutes, or continuous play. Operates as a room temperature indicator – star will glow white when temperature is optimal; red if the room is too hot; blue if the room is too cold. Measures in ºF and ºC. Operates as a night light and clock – offers illumination for feeding during the night without disturbing baby, and displays a 12-hour clock in AM/PM. Operates on 3 x AAA batteries (not included), or via the adaptor plug (included). If you're shipping this product overseas, please keep in mind that all our electrical appliances are fitted with Australian/New Zealand electrical plugs as standard.